Nano and Peke are happy to come to your home for some fun in Spanish. Invite some other friends to come along too! 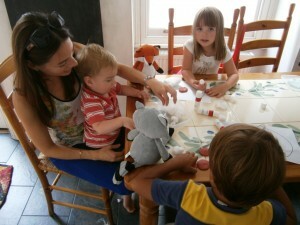 Have a little Spanish play group in the comfort of your home. Groups of between 3 and 6 children are ideal. Some groups rotate houses weekly. A minimum of 3 children is required. Local (SW) classes at home start from £30 per 45 min, for 2 children (£5 per additional child). A minimum booking of a 6 week course is required.